Preheat oven to 425 degrees F. Cut out two large rectangles of aluminum foil – overlap in a small baking dish. 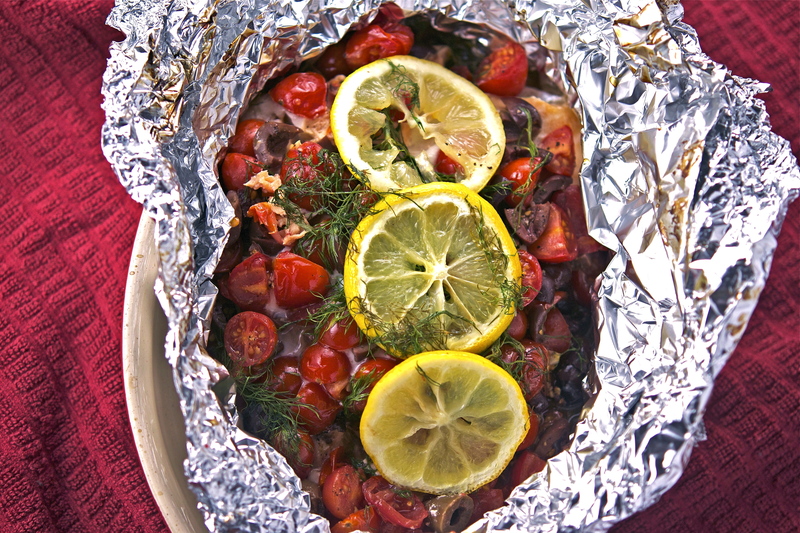 Set the fish on top of the foil. Brush with olive oil, and sprinkle with salt and pepper. Toss the olives, tomatoes, and thyme spring with 2 tablespoons of olive oil, then scatter over the salmon. Finally, cover with dill and arrange 3 to 4 slices of lemon on top. Bake for 20 to 25 minutes (or until cooked through). Serve immediately.